White teas are considered white because they undergo minimum processing. They are simply just plucked and dried. The liquor is the most delicate in flavor and color. Thus, these teas are steeped in water at 160 degrees F. for only 1 to 2 minutes. Young developing tea leaves, which are made into white teas, are thought by some to have the highest levels of antioxidants. Twelve Winds Tea Company white tea leaves are covered in silvery down and primarily come from the Hunan and Fujian Provinces. 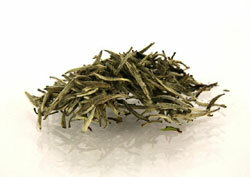 A superior white tea with a delicate aroma & flavor with a very pale, silvery green liquor. Every bud is whole, exact and covered in downy silver fuzz. This is a good tea to drink throughout the day and evening, especially for those sensitive to caffeine. Special occasions are well served by this unique tea. Like the Silver Needles, this tea is plucked, withered, and processed naturally with only warm air circulated as it slowly dries indoors. 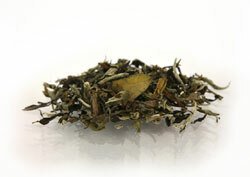 This white tea has the fullest flavor and best body of all the whites. Snow Peony is a mixture of downy buds with green, gray, and brown tea leaves from the Tai Mu Mountains in the Fujian Province. 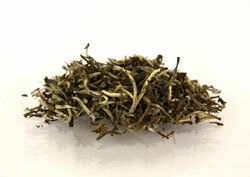 This white tea from the Hunan Province is a mixture of leaf bud and the next two leaves. It produces a light yellow-orange cup of tea that is vegetal and sweet.